I had so much fun on yesterday's radio episode of "There's A Rock For That!" Psychic medium and energy healer Melinda Carver was my guest. We talked about the different ways in which crystals enhance her work as a psychic. I thought what she had to say about clearing negativity energy from one's life was fascinating and helpful! I've posted the episode below in case you didn't have the opportunity to tune in to listen to the live episode. Enjoy! Melinda Carver on There's A Rock For That! Radio This Thursday! Tune in this Thursday for a very special episode of There's A Rock For That! Radio Show on BlogTalkRadio.com. My guest will be well-known and respected psychic Melinda Carver! My "Crystal Guest" will be Larimar. This is an episode that you won't want to miss. Besides being a truly remarkable individual, Melinda has a wealth of knowledge that she generously shares. As I said on last week's show, Melinda is one of the first people who encouraged me to follow my curiosity and pursue my interest in working with crystals in a metaphysical manner. So I'm thrilled to have her on the show! 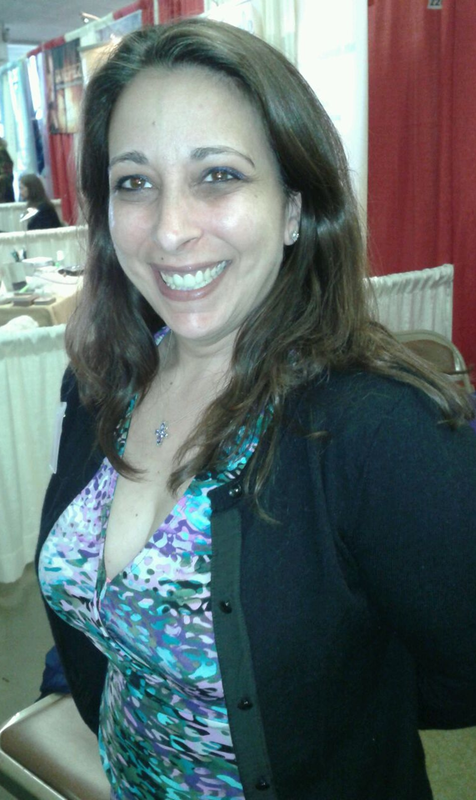 Melinda Carver is the Official Psychic of the Tarot Guild (USA), has appeared at metaphysical expos, conferences & fairs; and as a guest on various radio shows. She is a Clairaudient, Clairsentient & Clairvoyant Psychic Medium, Universal Light Minister, Tarot Reader & Positive Energy Specialist. Melinda is the host of Positive Perspectives Radio and the creator of Melinda’s Positive Energy Products. She is a member of the Coalition of Visionary Resources & featured in the Holistic Highway to Wisdom Series. Three of Melinda's products have been nominated for the Coalition of Visionary Resources Awards this June in Denver! Her Angel Magic Oil (which I have and love!) is nominated in the Aromatherapy category and her Harness the Magic of the Fairies CD workshop is nominated in the Video/CD/DVD category. Plus Holistic Highway to Wisdom DVD Series received a nomination for her Clearing the Negativity from Your Life! DVD workshop in the Video/CD/DVD category. Congratulations Melinda! You can listen to the show live online on Thursday, April 24, 2014 at 4PM EST by going to this link: http://www.blogtalkradio.com/rainbowpsychics/2014/04/24/theres-a-rock-for-that Listening online allows you to also join the fun in the chatroom! You can also listen on your phone by calling 347-637-3372, don't forget to press "1" if you have a question for Melinda. We won't be doing readings on this show, but will be happy to answer any questions you may have about the topics discussed. Did You Miss There's A Rock For That! Radio Yesterday? In case you missed yesterday's episode of There's A Rock For That! 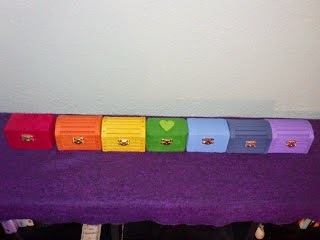 radio show, you can listen below, Topics discussed were medicine bags, magical boxes, and clear quartz. 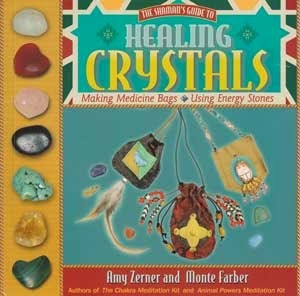 I spent some time discussing the book "Healing Crystals" by Amy Zerner and Monte Farber. I forgot to mention that Amy Zerner's jewelry can be found online at http://www.amyzerner.com/. The authors are opening a store in East Hampton, New York called "Enchanted World Emporium" which sounds fabulous and will carry their many products. It gives me yet another reason to visit New York! Luckily, they have an online store as well www.enchantedworld.com. On yesterday's show, the chatroom and calls kinda got away from me. Sometimes when I do this show I feel like I'm channeling and I'll admit I even have my eyes closed which makes it hard to pay attention to what's happening in chat and on the phones! Promise I will get better at that! But, like I said on the show, if you have any questions about the show topics or want to share your crystal experiences, please email me and I will either address it here on the blog or live on the show. You can email me at mary@tarotdactyl.net. Here's the show - hope you enjoy it! Today on "There's A Rock For That!" radio show I will be talking about medicine bags and magical boxes. I love keeping my crystals in special containers! I'll share some of the things I use to store them in as well as ideas on making your own bags and boxes and where you can find ones already made. My "Crystal Guest" for today's episode is Clear Quartz! It's going to be a fun show. Hope to see you there! 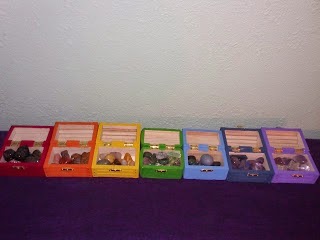 Meanwhile, here are a few examples of boxes and bags that I use for my crystals. Last week on There's A Rock For That! : Crystals, Tarot and Architecture Oh my! I had such a wonderful time with guest Jordan Hoggard on last week's show! We covered a lot of territory -- talking about crystals, Tarot, architecture and more. I was slightly bummed that BlogTalkRadio was having issues with the chatroom that day. For anyone who wanted to post a question in the chatroom, but couldn't because of the technical problems -- feel free to email me your questions and I'll address them on this week's show. My crystal guest last week was Green Tourmaline. 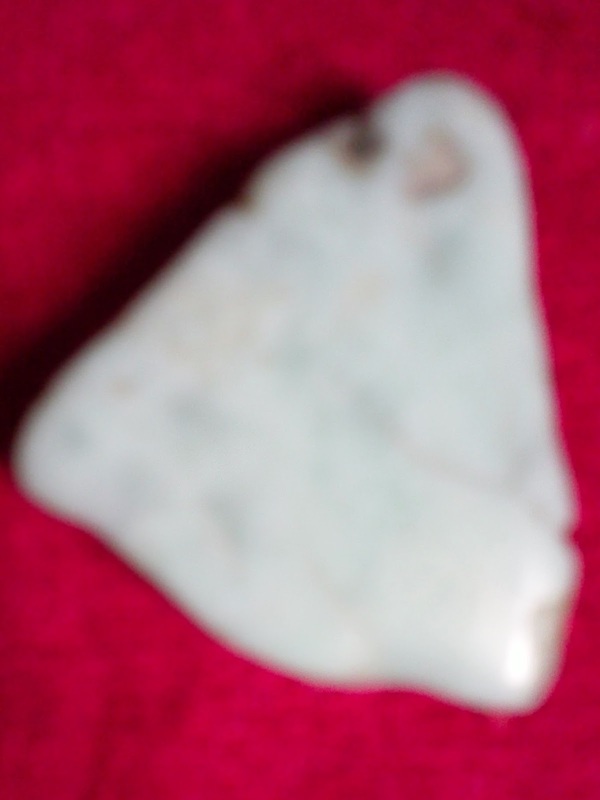 A wonderful heart chakra stone and a favorite of Jordan's. 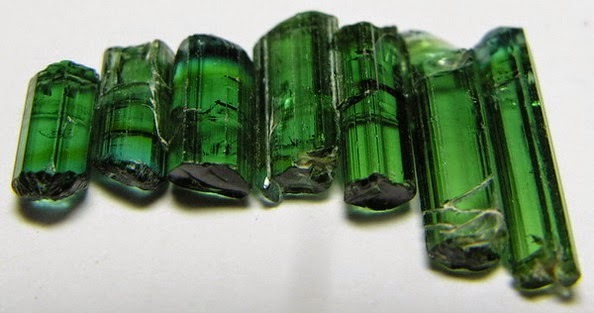 Green Tourmaline, aka Verdelite, is said to be helpful for visualization and quieting the mind as well as promoting compassion and patience. I love the color of it! Prettyrock.com has some gorgeous pics of it as well as some for sale, in case you can't find it locally. Meanwhile, if you missed the show last week, I've posted the episode below so you can check it out. Hope to see you in the chatroom this Thursday at 4PM EST. 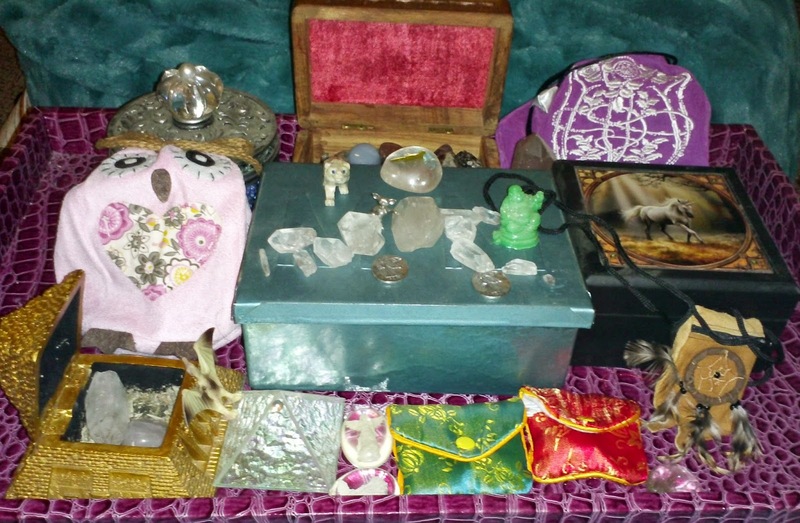 I'll be talking about medicine bags and magical boxes for your crystals! I'm so excited to have Jordan Hoggard as my guest on this week's episode of There's A Rock For That! radio. My "Crystal Guest" this week is Green Tourmaline, one of Jordan's favorite stones. This is an episode you will not want to miss! Many of us know him as the author of "Tarot in the Land of Mystereum" and "Powerscopes" --but did you know Jordan is a rock lover! As an architect, he has worked with rocks in their natural habitat. I can't wait to hear about his stone encounters! Jordan Hoggard is a Renaissance man, a true Polymath. 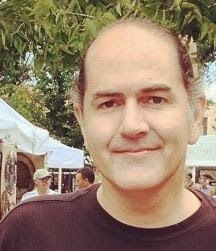 He is an internationally known Tarot Reader, Author, Artist, and Architect focusing on Sacred Architecture. Jordan is woo rather than woo woo. He refers to his intuition as Seeing With Cat's Ears where the 6th sense is a seamless synchromesh of the other 5 senses working together as naturally as an animal in the wild. This natural intuition fills his Tarot, Architecture, Writing, and Art with qualities of coming in straight from the beyond. Jordan’s painting is like an active meditation of divination. Design is divination in Architecture for him. 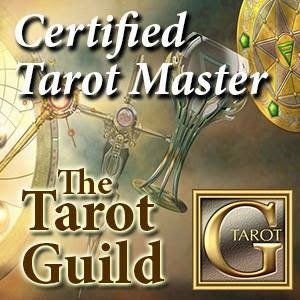 And, with Tarot all of his abilities come together to provide the service of empowering his clients with clarity they can effectively utilize in their lives. There is a comfort with the not-knowing and with the importance of process that keeps Jordan’s work fresh. In his watercolors he works primarily with subtle, architectural mandalas, and he explores colorful gestures of experience and feeling through his abstract expressionist work in oils. His work is like red and green chile for your soul that spices up your inner and outer spaces with rockin’ work that is alive and moving. His clients find that there is something about Jordan where by simply interacting with him or reading his work they are triggered and naturally cause to work on themselves their way as if without thought or will. Jordan’s work strengthens and enhances the freedom in peoples’ lives. This Week's Episode of "There's A Rock For That!" This week on "There's A Rock For That!" I talked about Angels and the crystals associated with them. I got some great calls from folks with really interesting questions. A few shared some fascinating stories of their experiences with angels! If you missed the show, you can listen below! Today on "There's A Rock For That!" Radio Show I will be talking about working with crystals in order to connect to the Angelic Realm. I'll share the methods that I have found effective for this and the many crystals associated with angels. I will also discuss some easy ways that you can try! There are so many possibilities when it comes to making the crystal-angel connection. As I've said on the show, I believe any stone can work for connecting with the angels. 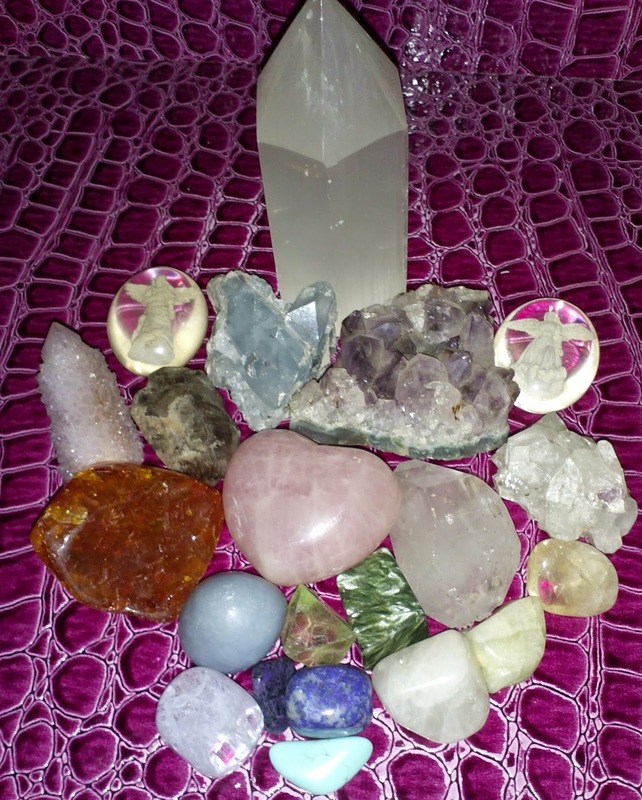 But, here is a photo of some of my favorite crystals that I use. 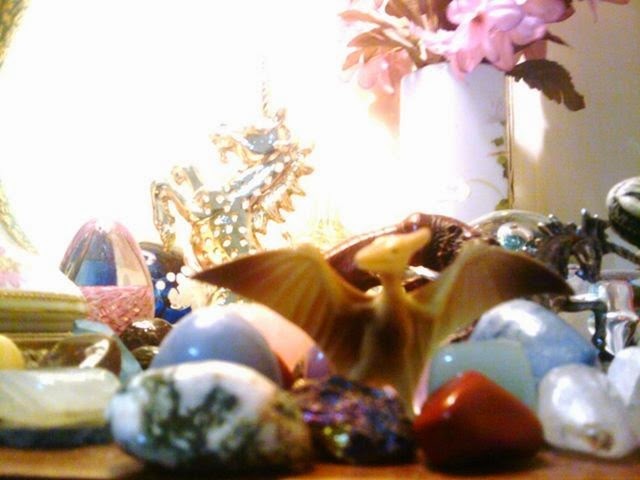 As a special surprise, since I'm a Certified Angel Card Reader, I will pull an Angel Card for my callers today and suggest stone options for working with that angel! The call-in number is 347-637-3372. The show starts at 4PM EST. I look forward to hearing from you!